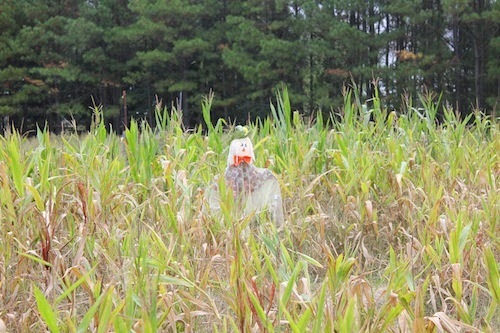 Autumn is here in North Carolina, and I love it. Though we've only been here for a few months, I'm already loving the changing seasons. People always complained that California doesn't have that, and I never really had a full understanding of what that meant. Sure, it went from hot to cold... we didn't have snow, but I'm cool with that. But here... I could pinpoint the week when summer transitioned to fall. Ok, enough melancholy. Fall means food. Family gatherings, apples, squash, soups... my mouth is watering thinking about it. My weekly CSA box has been filled with these goodies and I wanted to make a warm fruit crisp to enjoy some of the bounty. 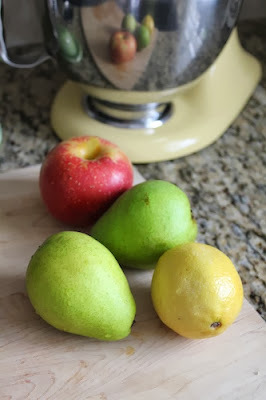 I didn't have any special ocassions or celebrations coming up, but I wanted a recipe that would use a variety of these fruits and make a small enough batch that hubby and I could finish it over a few days, or that I could easily serve when we have a couple of friends over for dinner. I downsized the original recipe and made a few changes. Even the hubby, who is not usually a fan of fruit-based desserts, wanted more. 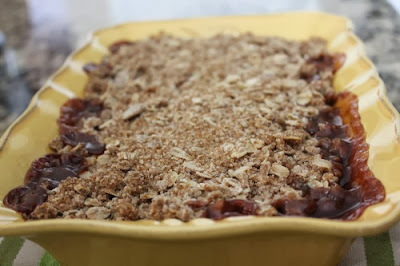 The combination of pears and apples was a nice change to the standard apple crisp. 1. In a medium mixing bowl, combine apples, pears, lemon juice and vanilla. Mix to coat. 2. In a separate bowl, mix sugars, flour, cornstarch, cinnamon, and nutmeg. Sprinkle the mixture over the fruit and stir until thoroughly combined. Pour into a small baking dish (9x9 or similar). Spread until mixture is evenly distributed and covering the bottom of the pan. 3. In a small saucepan, melt the butter over medium-low heat, ocassionally swirling the pan, until the butter is a golden brown color with a nutty smell. Transfer to a bowl to cool. 4. In a separate bowl, combine the oats, flour, salt, cinnamon, and brown sugar. Pour the butter over the mixture and stir until combined. 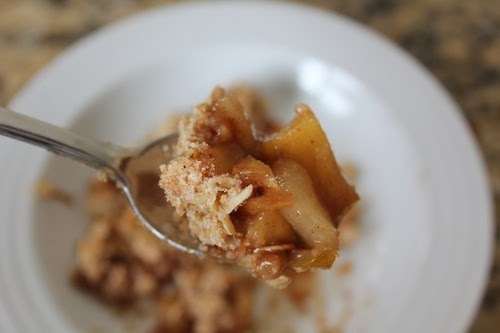 Crumble mixture over the pear and apple mixture in the baking pan. 5. 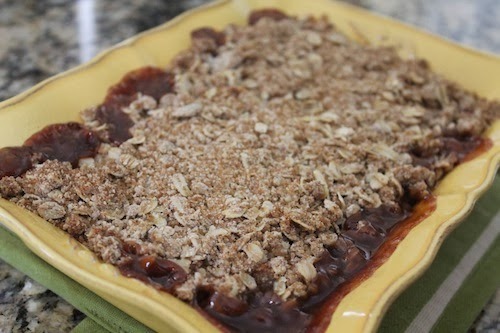 Bake for 35-45 minutes until the crumble is bubbling around the edges and the top is golden brown. Let cool slightly before serving.